For every 100 people who call 911, 33 people wait from 11 minutes up to an hour for help to arrive. In poor neighborhoods, in minority neighborhoods, in neighborhoods with high crime, the wait times can be even longer. This is a problem, because the average assault only takes 90 seconds. Even burglaries only last an average of 10 minutes. That means that on a good day, Police will arrive a few minutes after the criminal’s already left. On a bad day, they might not arrive for hours. But poor response time is just one reason why the old model of 911 is not working. There are more fundamental reasons why relying on the state for protection is a recipe for disaster. Unfortunately, cops have built a reputation of excessive violence. Cases of police abuse, fabrication of evidence, and the killing of family dogs is becoming more common every day. Some of these incidents are caused by bad cops. But mostly, the problem is systemic. Our whole system of relying on strangers who have special powers, rights and authorities above the rest of us will always fail because power ultimately corrupts and positions of power more often attract people who want to control others. Additionally, police have conflicting motives. They’re law enforcement, meaning that peoples’ safety takes a back seat to rigid enforcement of the law. That may be fine if every law was reasonable. But with bans on everything from raw milk to burning wood in your own fireplace, decent people can call the police only to find themselves under scrutiny or even arrest. For these reasons many people rightfully want as little police interaction as possible. So what do you do if you want protection, if you want to feel safe, but you don’t want to be totally reliant on the state? You step up and build a voluntary network of friends, family, and neighbors who can respond quickly and effectively to a variety of emergencies. Peacekeeper makes this process easy, simple and fun. Peacekeeper is law enforcement’s contradiction. Police exist primarily to enforce the law even if that means harming the people. A Peacekeeper exists to protect people from harm regardless of the law. 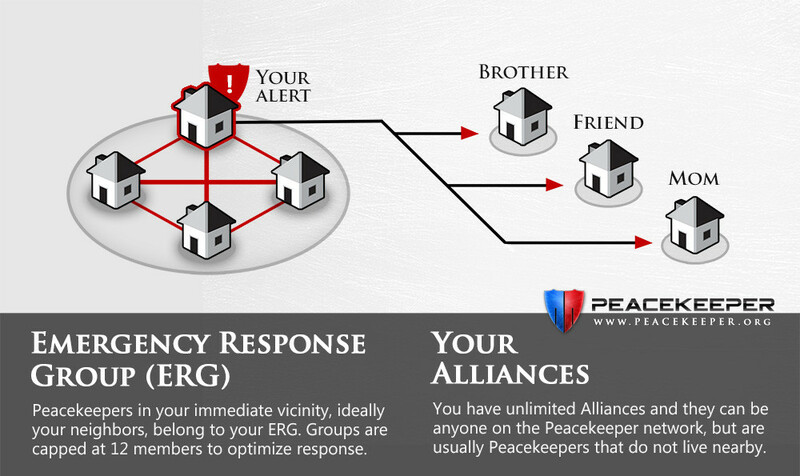 Peacekeeper is the first community-based emergency response app. 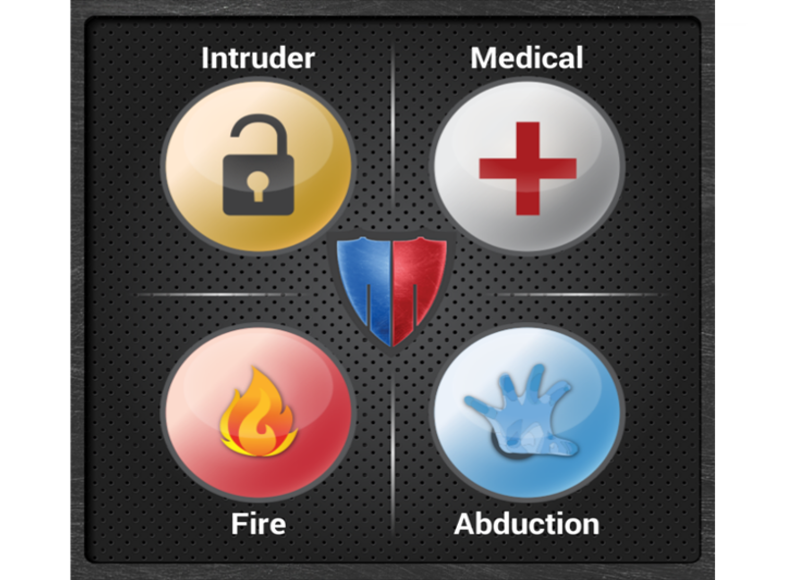 It enables you to rely on your personal Emergency Response Group (ERG)—friends and neighbors who can be at your house in seconds—when you need help. If you don’t want to wait on a failed bureaucratic system for protection, Peacekeeper is the world’s first alternative. To get started, download the app and share it with interested friends and neighbors. Set up your Emergency Response Group. When one person has an emergency—whether they’ve got an intruder in the house or they just had a heart attack and need CPR—they can send out an alert to their ERG. Friends and neighbors can show up in minutes or even seconds. Your ERG is completely voluntary—everyone is on there because they want to be. It’s community-based. Everyone knows each other, so you avoid the potentially lethal problem of injecting armed strangers into a crime scene. And your ERG can come help from across the street, instead of trying to get there across town. That makes Peacekeeper lightning fast. This isn’t about whether or not police are good people. It’s not about whether or not 911 used to work. It’s about giving people the tools to move beyond a failed, bureaucratic, and too often abusive system—and into something else. But even more than that, it’s about resurrecting the sense of community protection that 911 has eroded. I believe that people are inherently good. Most of us, given the chance to be a Good Samaritan, will. If your friend’s in trouble, you want to know. If your girlfriend’s being attacked, you have a gut desire to go fight for her. Peacekeeper, at its heart, is about giving you the tools to act on that benevolence. More than that, it’s about creating benevolent communities. Neighborhoods where people across the street watch out for each other instead of living atomistic lives. Housing and apartment complexes where you feel a bond with those who live near you, cemented by your mutual willingness to take care of each other in an emergency. Community is a building block of civilization, but too often communities become home to people who might not even talk to each other. That can be changed. A sense of community can be brought back with the press of a button — literally. Try Peacekeeper today. Introduce it to your friends and neighbors, and build an ERG that works to keep you safe. It could be the start of a whole new world. The Free Thought Project is not affiliated with the peacekeeper app, we simply see potential in it and wish to spread this potential.